An invitation to a black tie event might leave you wondering just how formally you should dress. Men might rush to rent a tuxedo, and women might peruse their closet for something supremely formal. Decipher the specifics of black tie attire to help you design a look that leaves you looking appropriate and feeling your best. A tuxedo is a classic men's choice for a black tie affair. 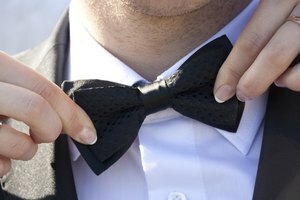 Select a black tuxedo with a black bowtie; a black cummerbund or vest is optional. Wear a white button-down shirt that is pleated, which adds a touch of formality. Wear patent leather shoes to complete the look. At some black tie events, a white tuxedo jacket is also appropriate. Reserve the white option for summer affairs, events that take place in tropical climates or a cruise, Emily Post advises. Two types of dresses are appropriately formal for women attending a black tie event. Floor-length gowns in dark colors, such as black, navy or brown, are suitable and elegant. Dressy cocktail dresses also fit the black tie dress code. A classic little black dress or a knee-length cocktail dress in silk or satin are event-worthy. Choose a cocktail dress with a touch of sparkle or embellishment to increase the level of formality. Occasionally, formal events might be designated creative black tie, a dress code that gives you more freedom in your wardrobe choices. Creative black tie for men still calls for a tuxedo, but the accessories can be more whimsical. Wear a polka-dot bow tie, patterned cummerbund or non-white tuxedo shirt. Floor-length gowns and cocktail dresses are still appropriate for women, but add intrigue to your outfit with bolder accessories. Choose large pieces of costume jewelry, a brightly colored pair of pumps or an antique clutch. White tie dress codes call for even dressier and more formal attire. For these events, the classic tuxedo is upgraded to a tuxedo jacket with tails, which should reach the back of your knees. Complete the look with a white bow tie, crisp white pleated shirt and white or gray gloves. Women should wear a formal, floor-length evening gown for white-tie events. Choose dressy fabrics, such as silk, chiffon, taffeta or satin. Enhance the formality of the look with well-coiffed hair, such as a classic French twist; glamorous jewelry, such as diamond earrings or a necklace; and dramatic makeup, which can include a bold lip color. Not every dress code is strictly black tie. For black tie optional events, men can choose to wear a dark suit, white dress shirt and conservative tie, such as a classic striped pattern. Leather dress shoes complete the look. Women can wear floor-length gowns or cocktail dresses, but dressy separates will do, too. Slip on a pencil skirt with a silk blouse or a dressy pant suit. What Is a Cocktail Dress Code? What Is the Difference Between Formal and Semi Formal?